Because Headspace decided to cancel their complete tour the ProgPower Europe organization had to find another opener. Luckily a great replacement was found in Polish VOTUM; a band that recently raised their profile as the support act for Riverside’s tour. VOTUM will be opening ProgPower Europe 2014 at Friday night October 3rd. Tickets for ProgPower Europe 2014 can be ordered at: http://www.progpowereurope.com/tickets. 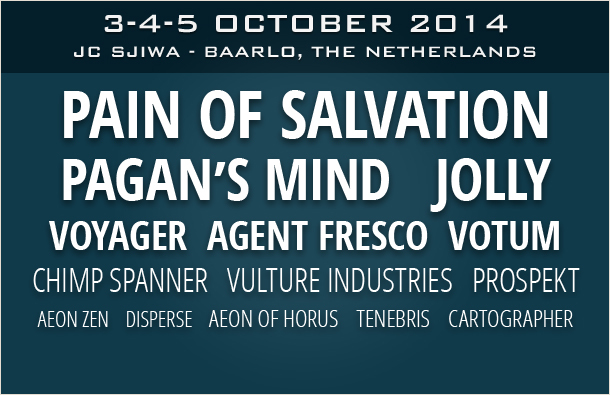 ProgPower Europe is a Progressive Metal festival held in Baarlo, Limburg, The Netherlands. Last year (2013) saw the celebration of 15 years of ProgPower Europe. In its history bands like: Opeth, Anathema, Fates Warning, Shadow Gallery, Symphony X, Evergrey, Threshold, Jon Oliva, Riverside and many many more have played the festival. This entry was posted in News and tagged 2014, progpower, votum. Bookmark the permalink.